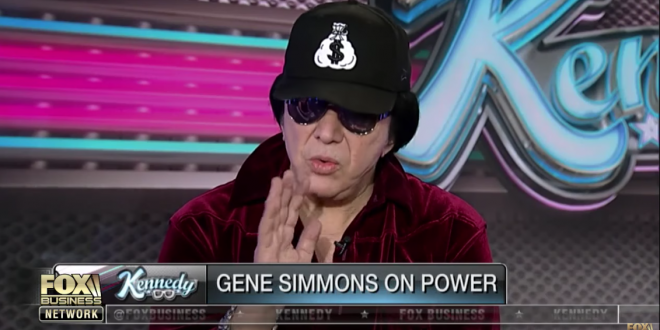 Gene Simmons Permanently Banned From Fox News - Joe.My.God. According to a knowledgeable Fox News source, Simmons showed up on the 14th floor to do a book-plugging interview with FoxNews.com’s entertainment section, but instead barged in on a staff meeting uninvited. “Hey chicks, sue me!” he shouted, and then pulled open his red velvet shirt to reveal his chest and belly, according to the source. Then he starting telling Michael Jackson pedophilia jokes, and then bopped two employees on the head with his book, making derisive comments about their comparative intelligence according to the sound their heads made when struck. “It was pretty severe,” the source said. After Simmons’s misconduct was reported to a supervisor, and then to human-resources executive Kevin Lord, the Kiss frontman was permanently banned from the building and will no longer be permitted on any Fox News or Fox Business Network programming.